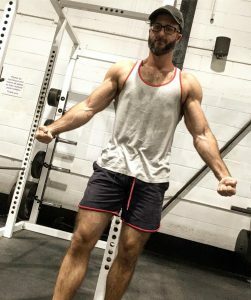 So, really, I didn’t start to see any success in the gym until a bunch of things happened. Three things were truly vital: learning proper form and forging a mind muscle connection with each exercise; summoning greater intensity and frequency in training; learning more purposeful and intelligent eating practices, eating focused on my goals. Each was necessary. I go into this in greater detail in my “Escape From Skinny-Fat Jail” video. But I should fess up – I was helped hugely along that path by hiring a trainer in September 2013. He taught me basically everything about form and mind-muscle connection, and also taught me a lot about intensity and frequency (eating, I’ve so far figured out on my own). I have to believe it’s possible to succeed without a trainer, that it is possible to be a gym autodidact and to make great progress. To correctly learn form from watching youtube videos. To have the native physical intelligence to understand and cultivate mind muscle connection after having learned the concept. However, my own experience – and the experiences of many people I know – suggest that hiring a competent trainer really is the best thing you can do to expedite the process. For me, I’m not sure I would have ever made it on my own. I had been trying for years, with very little to show for it. I was a failed gym autodidact. When you’re used to being intelligent, when ‘smart’ is a core part of your self concept, it is humbling to realize there are subject areas where you are kind of an idiot, where you don’t have the tools to lift yourself out of your ignorance and begin to succeed. In short: I needed help, and I’m glad I eventually sought it out. To the left is what I looked like before I got a trainer, in January of 2013. 6′ tall, 183 lbs, 25.1% body fat (according to a DEXA scan taken a couple of weeks after this photo). Keep in mind, I had been going to the gym and lifting weights for many years at that point. Trainers are not cheap. I was lucky, in that my trainer was near the bottom rung of the ladder in terms of cost, but was very competent and dedicated in terms of skill and education – some trainers are charlatans, and others are just apathetic. My guy was neither. I didn’t research him. I just got lucky. But even still, at $40 a session, this was an extravagence (financially offset by the fact that I stopped drinking, which is an expensive habit). Some gyms include a training session with membership. Some gyms, like many campus gyms at universities, have subsidized training which is cheaper than at commercial gyms. Ten sessions are better than none. Five sessions are better than none. Even three are worth your while – a trainer can show you what intensity looks like, can teach you new exercises, can correct your form in a way that means you will stop wasting your time doing exercises wrong, and risking injury to boot. Or one could sign up for a group lifting seminar, where a number of new people are taught the core lifts correctly. (Anxiety-provoking? Yes. But gym anxiety is a demon that has to be wrestled with and subdued if progress is to happen. Yes, I’m planning a video, naturally). I owe Sean, my old trainer, a gigantic debt of gratitude. I worked closely with him for about twenty months, until the gym where we trained was knocked down for Yet Another Condo Project (welcome to Toronto). In the year after that we still trained together sometimes, as we could fit it in. But we haven’t worked together regularly for a while, and not at all for a few months. I’ve been sole captain of my own ship since July 2016, programming my own workouts, making my own diet plan, etc. To the right is what I look like today. 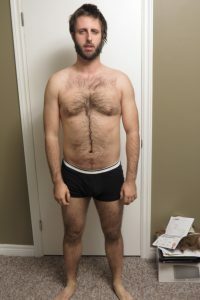 Still 6′, 187 lbs, body fat unknown but definitely a lot lower than it was. I have delts now! Tomorrow, I’m starting with a new coach. I say coach rather than trainer, because he’ll only be supervising one workout a week, but he’ll be setting every aspect of my training and nutrition for me. We’ll be working together very closely to push me toward my goals – and they’re ambitious goals. I don’t know what to expect. And I’m a little nervous. I want to be this guy’s star pupil. I want to wring every bit of benefit I can from this experience. I want to learn more. I want to see where this road goes.